CHICAGO (NEWS RELEASE) (WLS) -- Veteran broadcast journalist Charles Thomas, whose stellar career has spanned four decades, is set to retire March 3, 2017. Thomas made his mark as a broadcaster in both local and national arenas, for nearly 26 year as a general assignment reporter and then, political reporter for ABC 7 Eyewitness News and prior to that, as a Midwest correspondent for ABC News. Thomas joined ABC 7 Eyewitness News in September of 1991 as a general assignment reporter. After his promotion to political reporter in 2009, Thomas recalled that his first full day on the job coincided with Barack Obama's first full day in office. Prior to that, he worked for several years as a Midwest Correspondent for ABC News in Chicago and St. Louis. He has worked at various stations across the country including Kansas City, San Francisco and Philadelphia. Thomas has worked as a professional journalist since 1973, shortly after his graduation from the University of Missouri-Columbia School of Journalism. He began his career as a radio newscaster at KCMO-AM in Kansas City, Missouri. Thomas said, "Having served as ABC 7's political reporter for the past 8 years, I have had a front row to history. I cannot adequately describe how blessed I feel to work at the #1 television station in this city, with the best management team and coworkers in Chicago. Without a moment's hesitation I can look back and say I had the best TV reporting job in America." 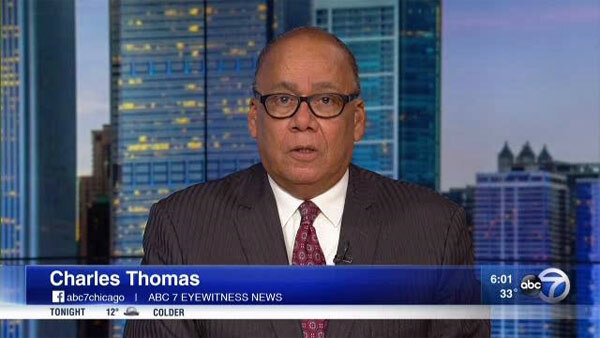 After his final day at ABC 7, Thomas plans to use his skill set on a soon to be announced digital platform "with the goal of helping the African American community take control of its own message and change the narrative to a positive one."